I’m not related to Catharine, but I would like to help her return to her family. The mystery is her surname – can you make out the spelling? If you are able to reunite Catharine with her family here or on Find A Grave, I will give you an honorable mention as the super sleuth you are! Thank you for taking a minute or two to remember this woman who died in 1887. This could be Catherine Mindar, wife of George, mother of Mary, George, Katie, Caroline, Lizzie, Frank, ((Rebecca)), and Flora. 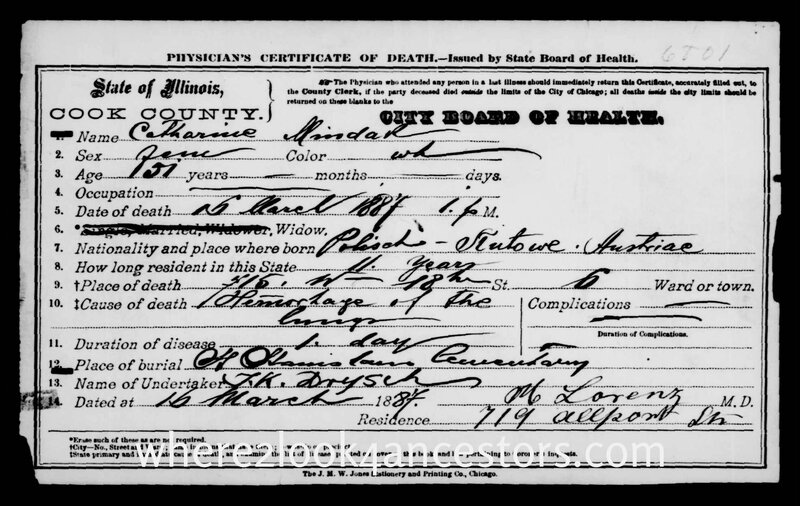 In 1880 they lived in Gardner, Sangamon County, IL. In 1870 they lived in Sacket, Sangamon County, IL. The name was incorrectly transcribed as “Merdu” and looks more like Minder than Mindar. See George Johann Minder at Find A Grave Memorial #62098292 and Fredericka Kathrine Vencenhafer at Find A Grave Memorial #62098244. There are a lot more facts available, but this is a good start. Good luck !! I take that back. The above George and Catherine are not the person in your death certificate. CTW – thanks for your help trying to connect Catharine with her family. I’m sure the answer is right around the corner! Good luck reuniting her with her family! KTC – thanks for following my blog and for your input. I created the F.A.G. memorial for Catharine a couple years ago, but never trusted my surname guess. Once I changed the spelling, Catharine became one of 36 Mindaks. I appreciate your help getting her into the right circle. Hi Brian – thanks for your input. Your vote was a wise one – Mindak is the winner – thanks for your help! Indicates required field Please choose a reason for your alternate. Thanks Jim – it’s match!